To Cite: Torabimehr F, Kazemi N, Hosseini S A. Effects of Resistance and Endurance Training on HIF-1α and VEGF in Heart Tissues of Pregnant Rats with Cadmium Toxicity, Gene Cell Tissue. 2019 ; 6(1):e88363. doi: 10.5812/gct.88363. Background: Exposure to cadmium can cause cardiovascular disorders, including possible risks of angiogenesis abnormalities associated with Hypoxia Inducible Factor (HIF), in pregnancy period. Objectives: This study aimed to investigate the effects of resistance and endurance training on HIF-1α and vascular endothelial growth factor (VEGF) levels in heart tissue of pregnant rats with cadmium toxicity. Methods: In this study, 48 female rats were selected and divided into 6 groups of 8 rats, including (1) cadmium, (2) resistance training, (3) resistance training with cadmium consumption, (4) endurance training, (5) endurance training with cadmium consumption, and (6) control. Groups 2, 3, 4, and 5 performed three weeks of resistance and endurance training, five sessions per week. Also, groups 1, 3, and 5 received cadmium as cadmium chloride dissolved in water as 400 mg per liter through drinking water. To analyze the data, Kolmogorov-Smirnov, One-way ANOVA, and Tukey’s post hoc tests were used and P ≤ 0.05 was considered statistically significant. Results: Cadmium had a significant effect on the increase of HIF1-α and VEGF (P = 0.001); resistance training had a significant effect on the increase of HIF1-α (P = 0.03), resistance training (P = 0.02) and endurance training (P = 0.001) had a significant effect on the increase of VEGF. Also, resistance training with cadmium consumption as well as endurance training with cadmium consumption significantly decreased HIF1-α (P = 0.001) and VEGF (P = 0.001), compared with cadmium consumption. Conclusions: Cadmium appears to lead to an abnormal increase in HIF-1α and VEGF in the heart tissues of pregnant rats, which can stimulate abnormal angiogenesis of tumors; however, resistance and endurance training can reduce the severity of cadmium effects on abnormal angiogenesis of the heart tissue of pregnant rats. The growth of tumors and generating cancers are major risks to pregnant mothers who are in an inappropriate and infected environment. From a pathological point of view, one of the major reasons for cancer development and tumor growth may be active, unnatural or pathological angiogenesis (1). In this regard, the hypoxia inducible factor-1 (HIF-1) plays a key role and it is sensitive to tissue oxygen tension. Hence the ability to sense and respond to the changes in oxygen concentration is a basic need for survival in all organisms, fluctuations in tissue oxygen tension can make changes at the gene level and protein synthesis level (2). HIF-1 was discovered as a transcription factor for the erythropoietin (EPO) protein-coding gene in humans in 1992. Studies showed that HIF-1 is a heterodimeric protein and it consists of an HIF-1α regulatory subunit and an HIF-1β subunit. When the intracellular oxygen level decreases, prolyl hydroxylase’s (PHDs) enzyme activity is inhibited and these conditions lead to nuclear transcription and synthesis of HIF-1α after the formation of the active heterodimer HIF-1 β, which has a fundamental role in the transcription of hypoxia-related genes, including angiogenesis, glycolysis, hematopoiesis, and catecholamines. Nowadays, more than two percent of human genes participate in HIF-1α synthesis in arterial endothelial cells, directly and indirectly (3), of which the vascular endothelial growth factor (VEGF) is the strongest endothelial mitogen (4). Animal experiments showed that the elimination of HIF-1α gene which encoded HIF-1α protein synthesis stopped the progression of fetal development during days 8 to 9 and led to lethal fetal conditions during days 10 to 11, along with cardiovascular disorders and decreased hematopoiesis (5). Therefore, HIF-1α and VEGF are essential signaling pathways for maintaining vascular density and supplying oxygen to hypoxic tissues (6). Cadmium is a soft metal with silver-white color found naturally in the earth’s crust and it doesn’t have a specific taste or smell. Although there are many reports which specifically concentrate on cadmium’s harmful effects, the studies conducted on the relationship between HIF-1α and cadmium toxicity are scarce. Scientific evidence shows that HIF-1α protein synthesis is regulated by oxygen-dependent mechanisms and conditions such as extreme physical activity along with general and positional decrease in oxygen tension as well as acidosis, oxidative stress, and heat shock have crucial roles in its stimulation (7). It was shown that in rats’ heart tissues, HIF-1α and VEGF levels were increased with both aerobic and non-aerobic training (8). On the other hand, some studies on other tissues showed different results, for example, three months of swimming resistance training had no effect on HIF-1α levels (9). Altogether, considering the cardiovascular system’s reaction to aerobic and resistance training exposed to environmental pollutants, especially during pregnancy, in addition to oxygen accessibility problems on one hand and lack of proper studies on the other, it’s hard to obtain a consensus on this issue. Accordingly, the present study aims to answer the question about the effects of three-week-aerobic and -resistance training on the VEGF and HIF-1α levels of heart tissue exposed to cadmium toxicity. 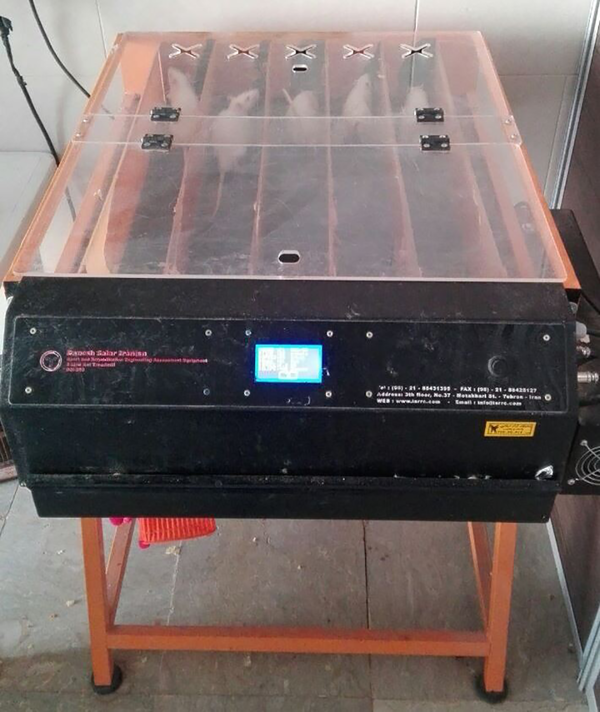 In this study, 48 adult female wistar rats were selected and after transferring the rats from Iran’s Pasteur Institute to the laboratory and familiarizing them with the new environment, each pair of female rats mated with one male rat. After 48 hours, the first day of pregnancy was determined by checking the vaginal mass; and then in order to adapt to the new environment, the rats were kept in clear polycarbonate cages in groups of four, the room temperature was 23 ± 2°C, humidity 45 to 55% and the light/dark cycle was 12:12. All ethical and legal aspects of this research declared work with animals were in accordance with the basic principles of the Helsinki Declaration of 2008. According to the Helsinki Statement, all five rats were kept in autoclaved transparent polycarbonate cages, allowed the animals to rest and these cages were designed to allow the animals to be permanently viewed by the caregiver. Also, the animals were not injured by cage parts in their sudden movements and the cages were designed in such way to prevent the animals from escaping. Then the animals were randomly divided into six equal groups of eight, including (1) cadmium, (2) resistance training, (3) resistance training with cadmium, (4) endurance training, (5) endurance training with cadmium consumption, and (6) control. During pregnancy, cadmium (provided with high purities from Sigma-Aldrich Company) was consumed as a cadmium chloride aqueous solution with the amount of 400 mg/L through drinking water (10). Groups 4 and 5 ran on a treadmill (with six lines for running of rats) designed specifically for rats (Figure 1) for three weeks, five sessions per week. In all period of research, the control group did not receive any cadmium and exercises and just did their daily activities. The duration of endurance training on the first day was 30 minutes, with a gradual increase in training duration in the third week to 60 minutes. Also, the training overload which increased the training volume was set up by speeding up to 20 m/min during the first week and 30 m/min during the final week (11). Also, groups 2 and 3 performed resistance training with 30 to 50% body weight for three weeks, five sessions per week. These training included climbing a one-meter-long ladder while having weights attached to the rats’ tails. The ladder had 26 steps and was placed at an 80-degree-angle. The selected weights were 30% of the rats’ body weight at the beginning and they were increased up to 50% of their body weight at the end. From beginning to end, there were four sets and six repetitions in each set of resistance training. There were 1-minute-rest intervals between repetitions and 3 minutes between sets. For the warm-up, the rats climbed the ladder twice (weight free) before and after each training session (12). It should be noted that as the main aim of present study was to review and compare the effects of two kinds of exercises in pregnant rats with cadmium toxicity; we just used one dose of cadmium consumption, but we examine the effect of two kinds of different exercises. To measure the VEGF and HIF-1α levels, the heart tissues of rats were sampled two days after delivery. Heart tissue was taken and weighed with an accuracy of 0.001 using the Sartorius: B1 1500 scale. First, the tissues were pulverized using liquid nitrogen and then they were homogenized in a buffer solution and centrifuged for 15 minutes at 4°C and 14000 rpm (11). In order to determine the required index, the resulting solution was transferred to the lab on dry ice. In this study, HIF-1α values of heart tissue were measured using the Canadian-made kit (KA1321) and the VEGF levels using the Japanese-made kit (27101A. Rat VEGF Assay kit - IBL) with the ELISA method. For ethical considerations, animal experimental procedures were in accordance with institutional guidelines and approved by the Ethical Committee of Laboratory Animals Care at Marvdasht Islamic Azad University, Marvdasht, Iran (IR.MIAU.REC.1396.187). In the end, to test the normal distribution of the findings, Kolmogorov-Smirnov test was used. Also, to analyze the findings, one-way analysis of variance analysis (ANOVA) and Tukey’s post hoc tests were used and P ≤ 0.05 was considered statistically significant. In Figures 2 and 3, the mean and standard deviation of HIF1-α and VEGF of rat heart tissue are presented in the six groups of the study. The results of One-way ANOVA test showed that there was a significant difference between the levels of HIF1-α (F = 48.42 and P = 0.001) and VEGF (F = 49.47 and P = 0.001) in the heart tissue of six groups of rats. The results of Tukey's post hoc test in showed that HIF1-α levels of heart tissue in cadmium group (P = 0.001), resistance training group (P = 0.03), resistance training with cadmium group (P = 0.001) and endurance training with cadmium group (P = 0.001) were significantly higher than the control group (Figure 2); in resistance training group it was significantly lower than cadmium group (P = 0.001), resistance training with cadmium group (P = 0.02) and endurance training with cadmium group (P = 0.001); in resistance training with cadmium group, it was significantly lower than cadmium group (P = 0.001), however, it was significantly higher than endurance training group (P = 0.01) (Figure 2); In the endurance training group, compared to the cadmium group (P = 0.002) and endurance training with cadmium group (P = 0.001) it was significantly lower (Figure 2). Also, endurance training with cadmium group it was significantly lower than cadmium group (P = 0.001). However, there was not a significant difference in HIF1-α levels of heart tissue among endurance training and control groups (P = 0.10), resistance training, endurance training groups (P = 0.22), resistance training with cadmium, and endurance training with cadmium groups (P = 0.22) (Figure 2). Figure 2. Levels of HIF1-α in heart tissue of rats in six groups of the study. * Significant increase compared with control group. ≠ Significant decrease compared with cadmium group. Figure 3. VEGF levels of rats’ heart tissue in six groups of the study. * Significant increase compared with control group. ≠ Significant decrease compared with cadmium group. The results of Tukey’s post hoc test in showed that VEGF levels of the heart tissue in resistance training group (P = 0.02), endurance training group (P = 0.001), cadmium group (P = 0.001), resistance training with cadmium group (P = 0.001), and endurance training with cadmium group (P = 0.001) were significantly higher than the control group (Figure 3); in contrast, in resistance training group it was significantly lower than cadmium group (P = 0.001), resistance training with cadmium group (P = 0.001), and endurance training with cadmium group (P = 0.001) (Figure 3); In resistance training with cadmium group it was significantly lower than cadmium group (P = 0.001) (Figure 3). 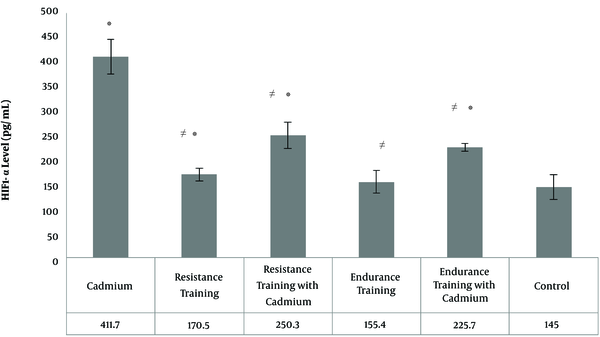 However, in resistance training with cadmium group it was significantly higher than endurance training group (P = 0.001); in the endurance training group it was significantly lower than the cadmium group (P = 0.001), and endurance training with cadmium group (P = 0.001) (Figure 3). 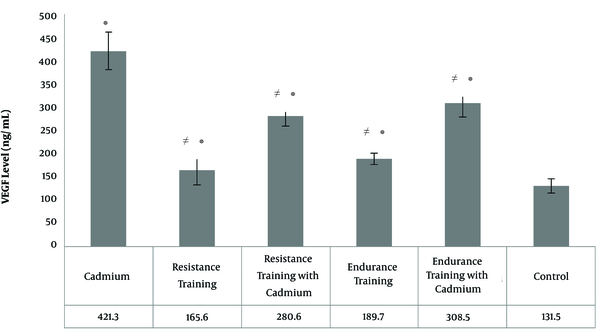 Also, in the endurance training with cadmium group it was significantly lower than the cadmium group (P = 0.001), however, there was no significant difference in the level of VEGF in the heart tissue between the resistance training group and the endurance training group (P = 0.26), as well as resistance training with cadmium group with cadmium group (P = 0.19) (Figure 3). The results of the present study showed that three weeks of endurance and resistance training caused a significant decrease in HIF-1α levels of pregnant rats’ heart tissues. Ookawara et al. (2002) claimed that three months of swimming resistance training had no effect on HIF-1α levels (9). However, results from most studies on tissue levels are not in the same direction as the present research (8). One of the probable causes of this difference is that HIF-1α is expressed in most of the tissues such as brain, liver, kidneys, heart, skin, uterus, spleen, and muscles in mammals (13). Consequently, different tissues may not have the same response to different physical exercises. In order to create adaptability in responses to physical training, various factors should work together systematically and positionally (8). Positional hypoxia caused by physical training is one of the first stimulants for adaptations such as increase in capillary density and oxidative capacity, and mechanisms such as mitochondrial activities, which adapt to the changes they and are very sensitive to oxygen availability (13). On the other hand, the increase in reactive oxygen species (ROS) gets involved in HIF-1α regulation as a result of the increase in oxygen intake during physical activities (14). Also, the findings of this study showed that three weeks of endurance and resistance training resulted in a significant increase in VEGF of heart tissues in pregnant rats. In consistent to the present study, it was shown that aerobic and non-aerobic training led to an increase in VEGF levels (8). The increase in VEGF levels was also seen in the Nourshahi et al. study (10). On the other hand, a few studies had different results, including Shekarchi Zadeh et al. study, which showed that four weeks of resistance training had no effect on serum VEGF levels (12). As in some studies, the serum levels of this protein was assessed 48 hours after the last training session (12), which is basically different from the present study’s method. It’s also important to note that physical activity leads to activation of multiple pathways, which their importance is recognized in angiogenesis. These pathways could be related to metabolism, capillary formation and might include calcium-regulated pathways. The present study showed that cadmium consumption significantly increased HIF-1α and VEGF in pregnant rats. On the other hand, resistance and endurance training in pregnant rats exposed to cadmium toxicity resulted in significant decrease of HIF-1α and VEGF. In agreement with the present study, it was shown that cadmium caused an increase in HIF-1α levels by increasing metallothionein (15). It seems that appearing of hypoxic conditions depends on various factors, which as a positional environmental stimulant can send the necessary signals for blood vessel formation. In the present study, cadmium chloride’s effect was impressive on the increase in VEGF and HIF-1α protein expressions. These increased levels can stimulate unnatural angiogenesis and consequently, tumor growth (16). Therefore, it could accelerate tumor angiogenesis in the pregnant mothers’ heart tissues. Although the precise mechanism of cadmium’s effects on angiogenesis is still to be understood (17), studies have shown that cadmium has a significant effect on angiogenesis by affecting extracellular signal‐related kinase (ERK) factors,(protein kinase B) Akt signaling, and also increasing HIF-1α and reactive oxygen species levels. It’s possible that in pregnant women, the increase in HIF-1α and VEGF levels won’t alongside increase enough in tissue angiogenesis. In relation to this matter, studies showed that excessive increase in VEGF levels during pregnancy caused by lack of increase or even decrease in fms-like tyrosine kinase 1 (FLT1) receptors, wouldn’t lead to vascular structure growth (18). One of the limitations of the present study was that the index or capacities for oxidative stress weren’t measured. It seems probable that the increase in heart tissue’s HIF-1α and VEGF levels caused by cadmium chloride was related to the increase in reactive oxygen species; therefore, there is a need for further studies to clarify this matter. The results of this study showed that cadmium toxicity leads to a significant increase in HIF-1α and VEGF in the heart tissues of pregnant rats. On the other hand, endurance and resistance training can mitigate the harmful effects of cadmium and reduce HIF-1α and VEGF levels significantly in heart tissues of pregnant rats. The authors of this article are grateful to the Vice-Chancellor of Research and Technology of Islamic Azad University of Marvdasht Branch. Authors' Contribution: All authors had an equal role in designing, work, statistical analysis, and manuscript writing. Conflicts of Interests: The authors declared that they had no conflict of interests. 1. Weidner N, Folkman J, Pozza F, Bevilacqua P, Allred EN, Moore DH, et al. Tumor angiogenesis: A new significant and independent prognostic indicator in early-stage breast carcinoma. J Natl Cancer Inst. 1992;84(24):1875-87. doi: 10.1093/jnci/84.24.1875. [PubMed: 1281237]. 2. Shimoda LA, Semenza GL. HIF and the lung: Role of hypoxia-inducible factors in pulmonary development and disease. Am J Respir Crit Care Med. 2011;183(2):152-6. doi: 10.1164/rccm.201009-1393PP. [PubMed: 21242594]. [PubMed Central: PMC3159088]. 3. Ke Q, Costa M. Hypoxia-inducible factor-1 (HIF-1). Mol Pharmacol. 2006;70(5):1469-80. doi: 10.1124/mol.106.027029. [PubMed: 16887934]. 4. Semenza GL. HIF-1: Mediator of physiological and pathophysiological responses to hypoxia. J Appl Physiol (1985). 2000;88(4):1474-80. doi: 10.1152/jappl.2000.88.4.1474. [PubMed: 10749844]. 5. Folkman J. Angiogenesis. Annu Rev Med. 2006;57:1-18. doi: 10.1146/annurev.med.57.121304.131306. [PubMed: 16409133]. 6. Chilov D, Camenisch G, Kvietikova I, Ziegler U, Gassmann M, Wenger RH. Induction and nuclear translocation of hypoxia-inducible factor-1 (HIF-1): Heterodimerization with ARNT is not necessary for nuclear accumulation of HIF-1alpha. J Cell Sci. 1999;112 ( Pt 8):1203-12. [PubMed: 10085255]. 7. Gavin TP, Westerkamp LM, Zwetsloot KA. Soleus, plantaris and gastrocnemius VEGF mRNA responses to hypoxia and exercise are preserved in aged compared with young female C57BL/6 mice. Acta Physiol (Oxf). 2006;188(2):113-21. doi: 10.1111/j.1748-1716.2006.01609.x. [PubMed: 16948798]. 8. Flora R, Freisleben HJ, Ferdinal F, Wanandi SI, Sadikin M. Correlation of hypoxia inducible factor-1α and vascular endothelium growth factor in rat myocardium during aerobic and anaerobic exercise. Med J Indones. 2012;21(3):133-40. doi: 10.13181/mji.v21i3.493. 9. Ookawara T, Suzuk K, Haga S, Ha S, Chung KS, Toshinai K, et al. Transcription regulation of gene expression in human skeletal muscle in response to endurance training. Res Commun Mol Pathol Pharmacol. 2002;111(1-4):41-54. [PubMed: 14632313]. 10. Bausero P, Ben-Mahdi M, Mazucatelli J, Bloy C, Perrot-Applanat M. Vascular endothelial growth factor is modulated in vascular muscle cells by estradiol, tamoxifen, and hypoxia. Am J Physiol Heart Circ Physiol. 2000;279(5):H2033-42. doi: 10.1152/ajpheart.2000.279.5.H2033. [PubMed: 11045935]. 11. Noorshahi M, Hedayati M, Nemati J, Ranjbar K, Gholamali M, Koomesh J. Studying the effects of 8 weeks of resistance training on serum vascular endothelial growth factor and endostatin levels in rats. Koomesh J. 2012;13(4):479-4. 12. Shekarchi Zadeh P, Khazaie M, Gharakhanlu R, Karimian J, Safarzadeh A. [Effects of resistance training on nitric oxide plasma, VEGF and its receptor type-1 levels in healthy male rats]. Isfahan Med Sci J. 2012;30(176):1-10. Persian. 13. Ohno H, Shirato K, Sakurai T, Ogasawara J, Sumitani Y, Sato S, et al. Effect of exercise on HIF-1 and VEGF signaling. J Phys Fitness Sports Med. 2012;1(1):5-16. doi: 10.7600/jpfsm.1.5. 14. Trisciuoglio D, Iervolino A, Zupi G, Del Bufalo D. Involvement of PI3K and MAPK signaling in bcl-2-induced vascular endothelial growth factor expression in melanoma cells. Mol Biol Cell. 2005;16(9):4153-62. doi: 10.1091/mbc.e04-12-1087. [PubMed: 15987743]. [PubMed Central: PMC1196326]. 15. Person RJ, Tokar EJ, Xu Y, Orihuela R, Ngalame NN, Waalkes MP. Chronic cadmium exposure in vitro induces cancer cell characteristics in human lung cells. Toxicol Appl Pharmacol. 2013;273(2):281-8. doi: 10.1016/j.taap.2013.06.013. [PubMed: 23811327]. [PubMed Central: PMC3863781]. 16. Gordan JD, Simon MC. Hypoxia-inducible factors: Central regulators of the tumor phenotype. Curr Opin Genet Dev. 2007;17(1):71-7. doi: 10.1016/j.gde.2006.12.006. [PubMed: 17208433]. [PubMed Central: PMC3215290]. 17. Woods JM, Leone M, Klosowska K, Lamar PC, Shaknovsky TJ, Prozialeck WC. Direct antiangiogenic actions of cadmium on human vascular endothelial cells. Toxicol In Vitro. 2008;22(3):643-51. doi: 10.1016/j.tiv.2007.12.009. [PubMed: 18243643]. [PubMed Central: PMC2349099]. 18. Li HP, Chen X, Li MQ. Gestational diabetes induces chronic hypoxia stress and excessive inflammatory response in murine placenta. Int J Clin Exp Pathol. 2013;6(4):650-9. [PubMed: 23573311]. [PubMed Central: PMC3606854].